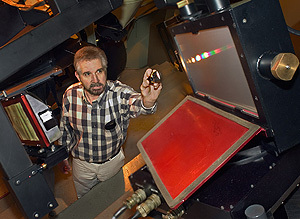 Steven Vogt with the Hamilton Spectrograph used to detect extrasolar planets. Photo copyright Laurie Hatch. A team of American astronomers announced today the discovery of a fifth planet around a star called 55 Cancri. Located 41 light-years away in the constellation Cancer, this star now holds the record for the number of confirmed extrasolar planets orbiting within its planetary system. The discovery marks an exciting new era, in which astronomers begin to explore how solar systems are formed and whether ours follows a pattern that's common throughout the universe, according to Steven S. Vogt, professor of astronomy and astrophysics at the University of California, Santa Cruz, and a member of the planet search team. "Now we're able to find complex systems of planets," Vogt said. "We're able to take long strings of data and eke out signals of five or more planets around a given star; so we're starting to see systems that look more like our own solar system." Astronomers have found nearly 250 exoplanets, but only one other star, mu Ara in the southern sky, is known to have four planets. The unique 55 Cancri system is notable because its clutch of four inner planets and one giant outer planet resembles our own solar system, although without an Earth or Mars. The star also has nearly the same mass and age as our sun. As more data accumulates, more planets around 55 Cancri are likely to be discovered, Vogt said. "There could be an Earth-like planet," said Vogt. "We can't see it yet, but we'll keep looking at this system." The mass of the newly discovered planet is about 45 times that of Earth and its composition and appearance may be similar to Saturn's. Its position is fourth out from its star, 55 Cancri, and it completes one orbit every 260 days. The new planet is located in the "habitable zone," a band around the star where the temperature would permit liquid water to pool on solid surfaces. The planet's distance from its star is approximately 116.7 million kilometers (72.5 million miles), slightly closer than Earth to the sun, but it orbits a star that is slightly fainter than our sun. The discovery comes after 19 years of observing 55 Cancri and represents a milestone for the California and Carnegie Planet Search team, which this year celebrates the 20th anniversary of its first attempts to find extrasolar planets by analyzing the wobbles they cause in their host star. The team included Geoffrey Marcy, an astronomer at the University of California, Berkeley, and Paul Butler, now at the Carnegie Institution of Washington, who both began observations of 55 Cancri and other nearby stars at UC's Lick Observatory in 1987. Debra Fischer, an astronomer at San Francisco State University, is lead author on the paper, which will appear in a future issue of Astrophysical Journal. The team's long history of highly precise measurements--more than 300 for 55 Cancri alone--made it possible to detect the presence of a fifth planet. Data from both the Lick Observatory on Mount Hamilton east of San Jose and the W. M. Keck Observatory in Hawaii contributed to the discovery. "We can hold very high measurement precision over decades," said Vogt, who built the instruments used by the team--the Hamilton spectrometer on the 3-meter Shane Telescope at Lick Observatory. Finding multiple planets around a star is difficult because each planet produces its own stellar wobble. Marcy compared detecting the wobble within wobbles caused by one of several planets to picking out a single musical note from many played simultaneously. The Doppler technique used by the search team sees this wobble as a change in the speed with which a star moves toward or away from us. The search team can detect velocities as small as 1 meter per second, which is walking speed. The planet population around 55 Cancri is somewhat different than the one orbiting our sun. The innermost planet is believed to be about the size of Neptune and whips around the star in just less than three days at a distance of approximately 5.6 million kilometers (3.5 million miles). The second planet out from the star is a little smaller than Jupiter and completes one orbit every 14.7 days at a distance of approximately 17.9 million kilometers (11.2 million miles). The third planet out from the star, the Saturn-mass one, completes one orbit every 44 days at a distance of approximately 35.9 million kilometers (22.3 million miles). The fourth planet out is the newly discovered one. The fifth and most distant known planet is four-times the mass of Jupiter and completes one orbit every 14 years at a distance of approximately 867.7 million kilometers (539.1 million miles). It is still the only known Jupiter-like gas giant to reside as far away from its star as our own Jupiter. UCSC's Gregory Laughlin, professor of astronomy and astrophysics, was also a coauthor. Using computer models, Laughlin tested the theoretical stability of the proposed system of planets orbiting 55 Cancri. Coauthors at other institutions include Jason Wright, John Johnson, and Kathryn Peek of UC Berkeley; Gregory Henry of Tennessee State University's Center of Excellence in Information Systems; and David Abouav, Chris McCarthy and Howard Isaacson of San Francisco State University. Funding for this study was provided by NASA and the National Science Foundation. The search for exoplanets will continue with future NASA missions. NASA's Kepler, scheduled for launch in 2009, is expected to find planets as small as Earth. Note to reporters: You may contact Vogt at (831) 459-2151 or vogt@ucolick.org. Geoffrey Marcy, Debra Fischer, and Paul Butler are best reached via e-mail: gmarcy@berkeley.edu, fischer@stars.sfsu.edu, and paul@dtm.ciw.edu.